Posted in Blue Cheeses and Stiltons, Cheese, Hard Cheeses. The Cropwell Bishop Blue Shropshire, is another cheese from the Cropwell Bishop Creamery, made by the Skailes family in Nottinghamshire, as detailed under our stocked Cropwell Bishop Stilton cheese. Bizarrely the Shropshire Blue has absolutely no ties to it’s namesake location, and has never been produced in Shropshire. The original Shropshire Blues actually originated from Scotland though are now mostly created in Leicestershire, Derbyshire and, obviously Nottinghamshire. The Cropwell Bishop Blue Shropshire is a semi hard, blue veined and russet coloured cheese, taking it’s colour from the added South American colouring agent, Annatto. The cheese is made with pasteurized cow’s milk, with a standard 48% fat, a natural brushed rind and takes five months to ripen and mature. 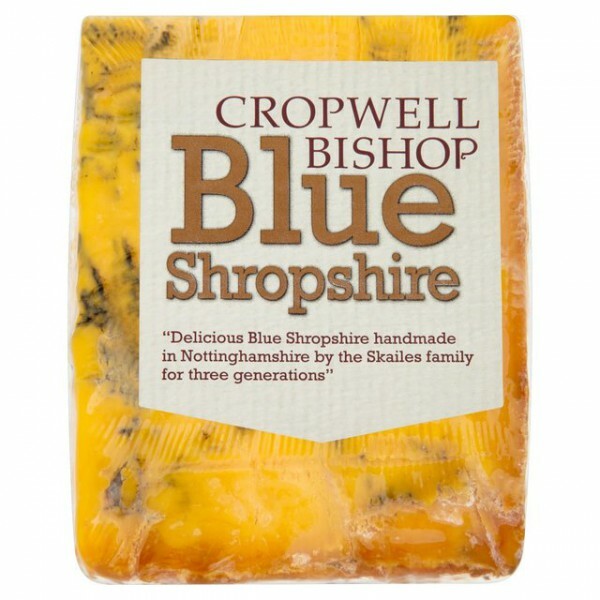 Cropwell Bishop Blue Shropshire cheese has been likened to a cross between Stilton and Cheshire cheese, and does have a reputable strength of character, for which it has won various awards including the 2006 Best English Cheese at the British Cheese Awards. Shropshire Blue has a slightly nutty initial taste, with a silky smooth, delicate texture and creaminess. It is a little denser than the Stilton Cropwell, but retains similar distinctive blue veining and a rich, rounded flavour. This is a truly versatile cheese, crumbles well into salads, and great to cook with, melted into sauces and with pasta, similar to the Stilton Cropwell Bishop. The Shropshire Cropwell Bishop also works well with fruit, walnuts and figs, especially accompanied by port and full bodied red wines.